The next stop on our Birthday Wine Tour through Amador was Terre Rouge. The first tour through Helwig took more than an hour and we tasted several wines (I believe more than 10), so the next stop needed to include a picnic. Terre Rouge has a litte bocci ball court and picnic table to spread out. We brought along cheese, crackers, and sandwich rolls. We also bought a bottle of wine inside so we could enjoy the sunshine! Casey brought them along, and we all played the part well! Inside the tasting room... yes, we left them on! We played a few games of BB, hung out in the sun while eating and drinking, and just had time to chat! It was a beautiful stop. Love the mustaches, so cute!!! Oh gosh! Looks like so much fun! 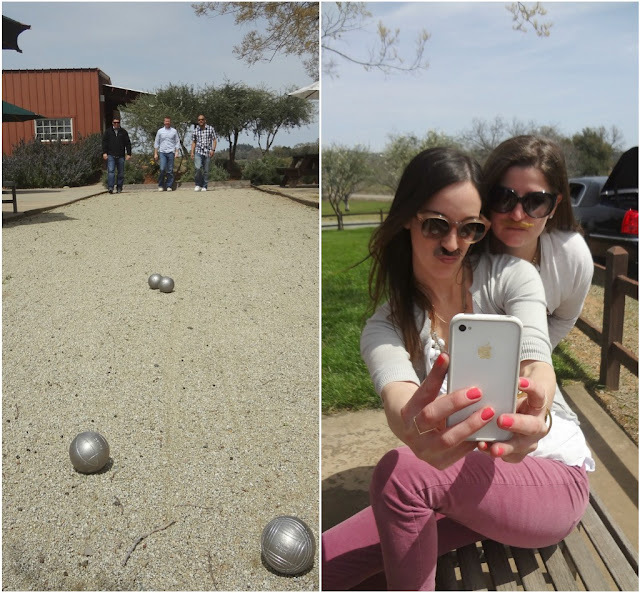 Rod and I are obsessed with Bocce Ball! We actually play in our backyard! lol y'all looked like you had such a fun time! Cute pics! I love those eclipse napkins! !